Emily Murphy is starting middle school with her best friend Hazel, but their friendship seems to be changing. Emily and Hazel have always been fans of the Unicorn Chronicles book series, but Hazel is not showing as much interest anymore and Emily isn't fitting in with Hazel's group of field hockey friends who care more about clothes and boys than unicorns. Emily's home life is also presenting it's own set of challenges. Her parents are recently divorced and her father has a new girlfriend and is trying too hard to make them a new family. Emily's also feeling a little uneasy about the changes that will occur now that her sister is returning home after getting treatment for her anorexia. Middle grade readers will be able to relate to Emily's struggles as she navigates life and friendships. The portrayal of middle grade friendships is quite realistic. Emily is an endearing character whose journey will make you grin at times and tear up at others. Throughout the book, she strives to "be the best you," something that she can teach readers how to do, as well. Jennifer Maschari's book is wonderful for its engaging, realistic plot, but also for her lovely style of writing. From lines, such as the opening, "Glitter is everywhere" to descriptions like, "Everything about Hazel is loud and clattery - like a cymbal clashing" she pulls the reader into the story. Then there are lines like this that hold so much truth: "Maybe this is the thing to know about growing up: There are some things in life you've got to hold on to. And there are other things you've got to let go. The key is knowing the difference." 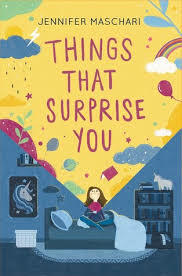 Middle grade books like Things That Surprise You are the kind we need more of because they are the kind that young readers can relate and learn from. I thank Jennifer Maschari for providing an advanced reader copy of this book to read and share with my #bookexcursion group. The lines quoted in this post were taken from this advanced reader copy.